The Rainforest Garden: I Put Googly Eyes on My Plants! I Put Googly Eyes on My Plants! 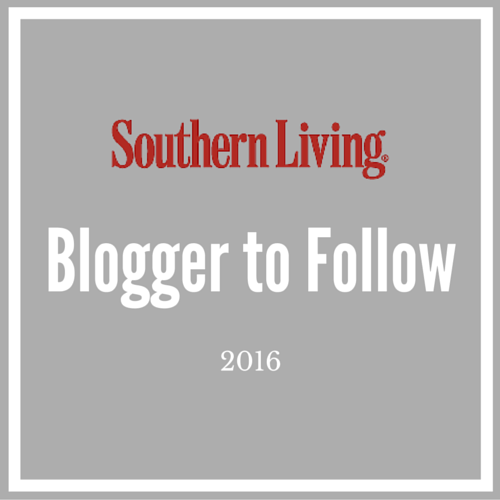 As you can tell by my ever evolving blog design, I can never leave well enough alone. If you took a look at the front page to my blog, you'll see that I've simplified and cleaned up the layout, and made previews so you can browse posts more easily. I always have to go and fix things that aren't broken, be it my blog, the garden, or even just plants. 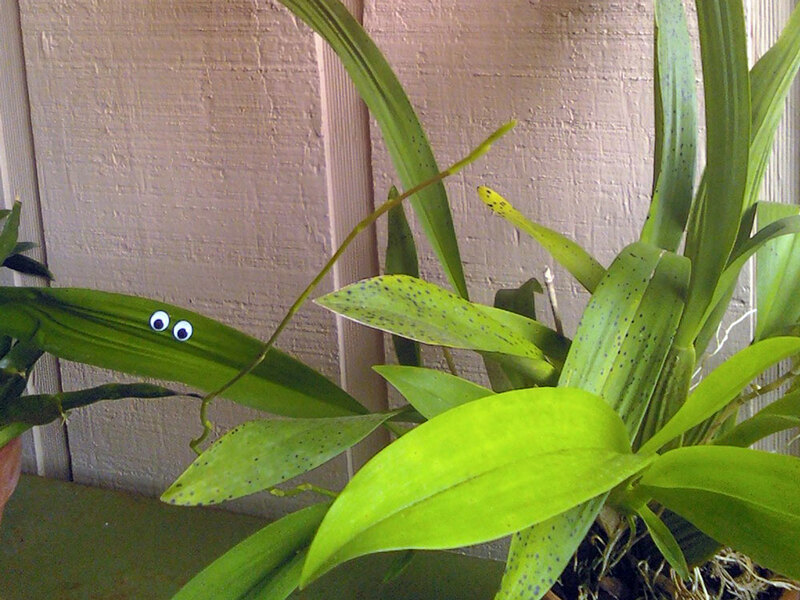 Just like Christopher Walken, my obsession with improvement is so bad, I go so far as to put googly eyes on my plants. 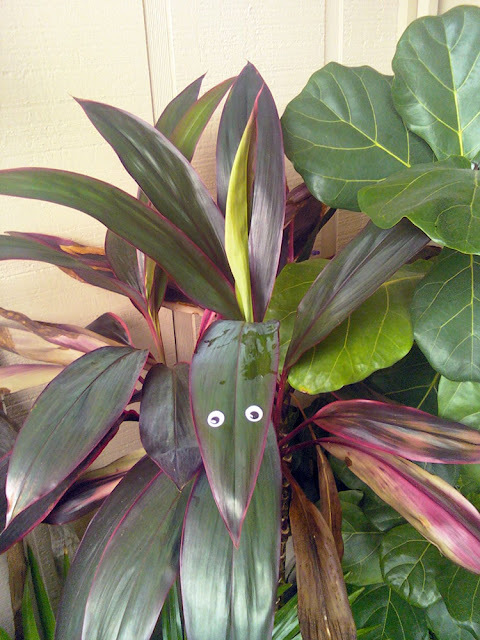 "The Gardener Who's Very Scared of Plants" puts googly eyes on his plants so he can make eye contact with them, so they're less likely to gang up on you. I am not afraid of my plants, but I feel that I'm much more likely to empathize with them if they're looking at me through a cloud of whiteflies or an encrusting of mealybugs, so they can communicate with me by saying, "Hey, I'm looking at you, I know you can see me, and these mealybugs are itching the bejeezus out of me." Kimberly from Garden In Paradise recently posted about how she meticulously scrubbed each sooty mold smothered leaf of her ailing mango tree, just to see its healthy green leaves again. I can relate, and so can most other gardeners. I'm sure you've heard that plants are healthier if you make regular contact with them by touching the leaves, and though I don't have a source to back it up, I do know that plants that reside under cover or indoors don't get rainfall and that a regular misting or wiping of the leaves is not only sanitary but extremely beneficial. You're not supposed anthropomorphize your plants, but I'm sure your pet dog is healthier with the extra attention it gets by treating it like an entity with a soul. You're much more likely to feed the dog and give it healthy interaction if you talk to it, pet it and and share your sentiments, and you're likely to be happier as a result. So why not plants? 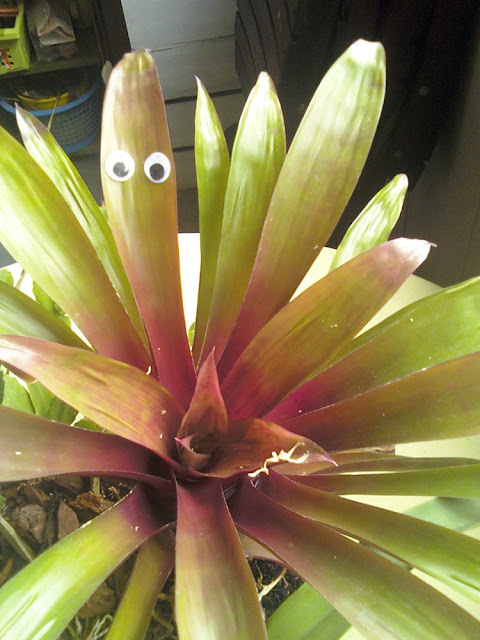 That's right, I propose we all put googly eyes on our plants. Once I popped those little plastic domes on this ti plant, it sprang to life and told me "Spider mites are sucking out my insides! For the love of God, please help me!" My goodness, how horrible! Thank goodness I put googly eyes on it, right? 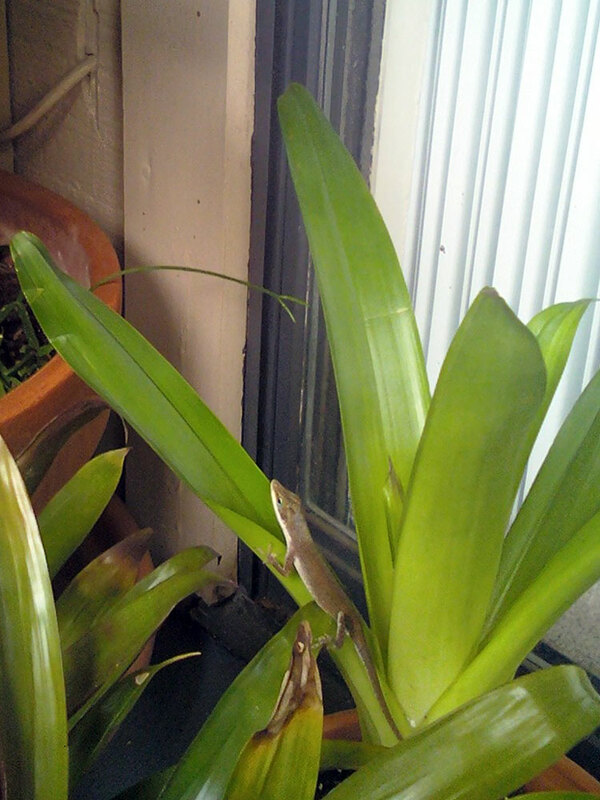 I gave the touch of life to my Oncidium "Sherry Baby" right before it told me that he's almost ready to bloom! How do I know its a "he"? He told me so... it seems that I've made him uncomfortable calling him "Sherry Baby" all this time. How embarassing! Yikes! This guy! Its hard to feel comfortable around him, but now we've made eye contact. I was about to take care of another bromeliad when I saw that it was already looking back at me! This anole was stealthily hunting some bugs for me. I'm sure that Sharry... I mean Barry will be grateful for that. 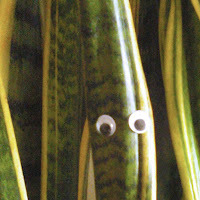 Googly eyes are for houseplants too! I'm sure my fiance will be so happy to sit down to The Office, drink some tea, and turn around to find this lady palm looking back at her! She's so lucky to have such a thoughtful guy around. 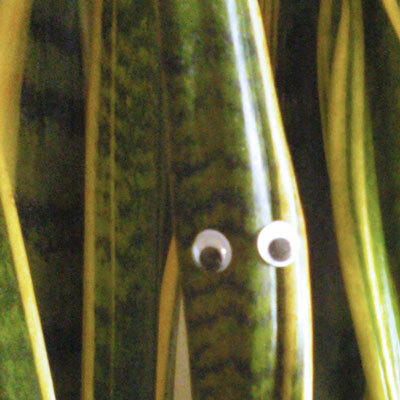 Be sure to join the facebook group, "I put googly eyes on my plants" to upload your own photos! Have you been talking to my husband? He proposed this the other night when we were having dinner on the patio. When I wasn't immediately behind the idea he hinted that he might just take matters into his own hands. The placement of your googly eyes is exceptionally well done. 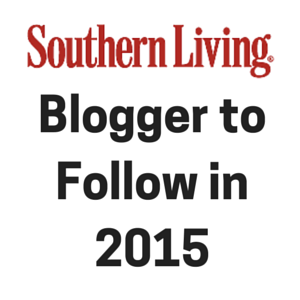 Loved your post too! Gotta have that cowbell... I actually have a cowbell tshirt. Thats so funny that he was thinking the same thing! He's seen the sketch on snl I hope... Stand by your man and start a revolution! I should start a meme. LOLOL! Thanks for this! I am laughing my tush off...hehehe. ROTFL! 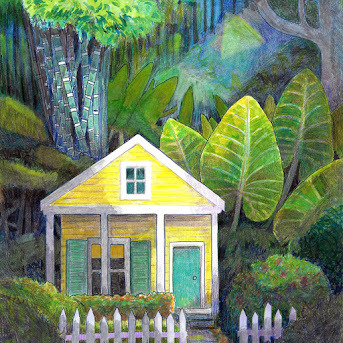 A gardener scared of plants! Hmmm... I wonder if googly eyes would help give me the courage to grow vines. Poor brom! What's he got against broms? P.S. My dogs do have souls. Lol! Priceless! Keep it up! Funny. I don't think I really want to make eye contact with some of my plants. I do talk to them though, much to my neighbor's amusement just the other day. Steve - those googly eyes are hilarious! You and my husband must have the same sense of humor; while I'm the 'gardener' of the family, HE is the 'Bill Murray' (not Christopher Walken)! 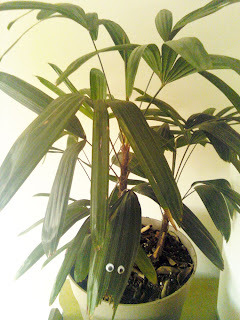 My Ficus tree (in the family room) has googly eyes staring up from the pot - as well as misc. action figures and Sponge Bob! LOL...love those eyes on your plant. Whoknow, you might just start a new trend. OMG! I've wanted to do that for so long! 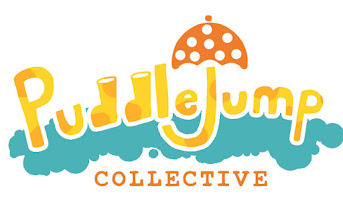 There's a facebook group? Yes Please!!! This one is really funny! I can’t believe that there is a gardener that is afraid on his own plants. How come it may? LOl. But I love the idea of making communicating of your plants. If only they can speak and talk too that will be easier for us gardeners to give what they need. What the heck! That is really a funny one. I never thought of doing that just to have communication to my plants. Lol. But it is really cute and I just wished that plants really have eyes to remember you everyday that they are living things also. Hahahaha! This one is really funny! 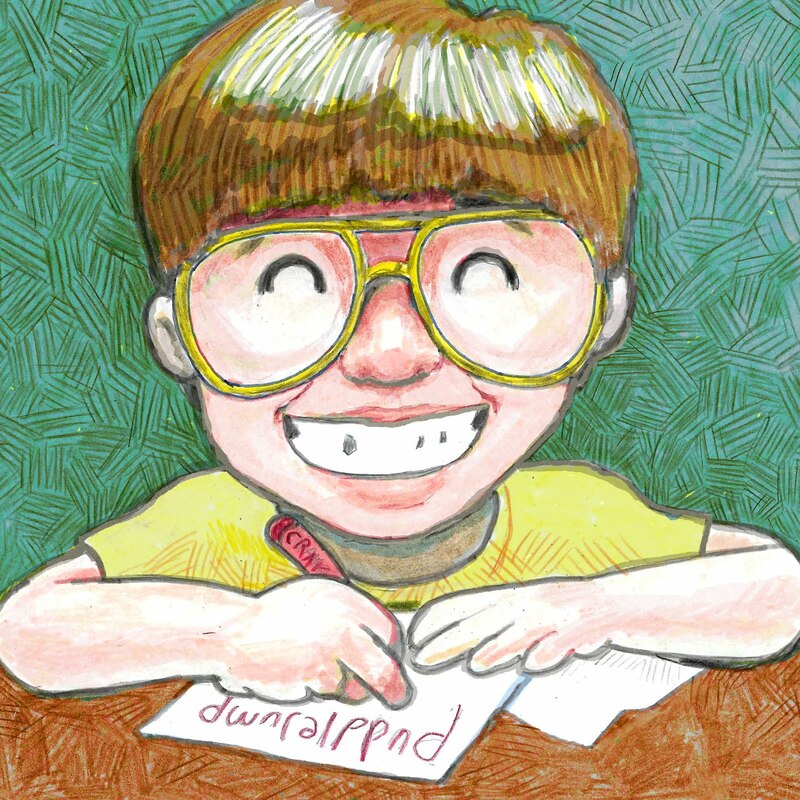 You make me really laughing out loud! I guess I should try this sometimes with my kids to have some bonding time with them. Maybe if we do this they will learn to care the plants and enjoy doing also some gardening chores. That's hilarious. I thought you were kidding. Should have known better. I'm pretty sure this is how someone found me by googling "why don't plants have eyes?"